This entry was posted on August 18, 2016 by Jessica Anderson. Let me help you choose the perfect trophy for your league! 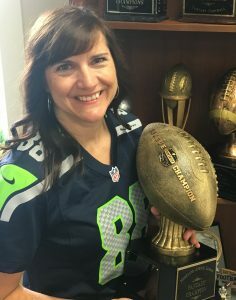 Hi I'm Jessica, Owner of Trophies2Go and a fantasy football widow. My husband has been in a league over 20 years so I know a bit about the fantasy season. At Trophies2Go, our team has helped many commissioners choose epic trophies for their draft. We often get questions about how to order Fantasy Football Trophies online - let me help you! Choose Your Fantasy Trophy First! Step 1: Choose Your Trophy. Many leagues choose perpetual trophies that they pass each year from winner to winner. This adds hype to the draft. Step 2: Side Plates. To engrave the winner's name each year, add the three blank side plate option. It costs an extra $10. Step 3: Enter Engraving For the FRONT. On the “customize” page, add your League Name and CHAMPIONS or whatever engraving you wish, it's FREE! Then add the trophy to your cart. Next ADD your past winners! Log your league's winners on the side of the trophy! Step 4: Search Product #7170. This is 'Fantasy Perpetual Engraving' (aka the winners). Step 5: Add Your Years to the Cart. Figure out how many years of engraving you need. If you want to add winners for 2013, 2014 and 2015, add "QTY3" for 3 years. -Line 3 is the Team Name (Big Money). Then move on to the next year, etc. After you've typed all the info, add it to your cart. That's it! 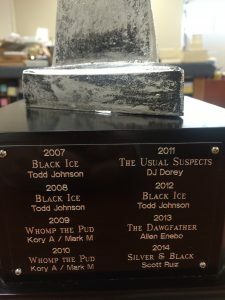 You can request a proof to check over your engraving - our awesome engravers work directly with you before etching.We ship your trophy to you and then you're all set for your draft! Slick & easy! Order an epic trophy for your draft now and have a fantastic football season!